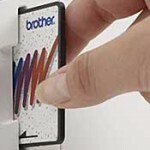 The Brother SE400 Computerized Embroidery and Sewing Machine comes with seven sewing feet (buttonhole, overcasting, monogramming, zipper, zigzag, blind hem, and button) and one embroidery foot. 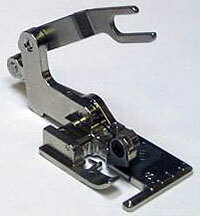 Other special purpose presser feet can make certain projects easier, faster, or more convenient. Overcast fabric edges and trim seam allowance at the same time with Brother’s SA 177 7mm side cutter foot. This handy, easy-to-use attachment measures and finishes fabric edges with straight or zigzag stitches similar to a serger. The centered post ensures consistent stitch formation. For use with the side cutter stitches. Compatible with the following Brother Sewing and Embroidery machines: SE-400, SE-350, HE-240, SE-270D, LB6770PRW, LB-6800PRW, PC-8500D, ULT-2003D, PC-6500, NX-200, NX-400, NX-600, CS-80, CS-8060, ES-2000, CS-6000T, CS-100T, CS-6000, Innov-ís 2500D, Innov-ís 1000, Innov-ís 1500D, Innov-ís 4000D, PC-8200, ULT-2001, ULT-2002D, PC-8500, NX-450, NX-250, NX-650Q, Innov-ís 1200, QC-1000, PC-210, PC-420, CS-6000i, CS-6000B, HE-120, CE-4000, EX-660, BC-1000, Duetta® 4500D, Innov-ís 40, Innov-ís 80, PC-210PRW, PC-420PRW, Innov-ís 900D, CE-5000PRW, HS-2000, Quattro™6000D, Innov-ís 2800D, Innov-ís 1250D, CE-5500PRW, Innov-ís 950D. Overcast fabric edges and trim seam allowance at the same time with Brother’s SA 178 5mm side cutter foot. The difference between the SA178 and the SA177 is the width of the seam allowance remaining. But 2mm is a very small amount. Compatible with the following Brother Sewing and Embroidery machines: SE-400, SE-350, HE-240, SE-270D, LB6770 PRW, LB-6800PRW, PC-8500D, ULT-2003D, PC-6500, NX-200, NX-400, NX-400Q, NX-600, CS-80, CS-8060, ES-2000, CS-6000T, CS-100T, CS-6000, Innov-ís 2500D, Innov-ís 1000, Innov-ís 1500D, Innov-ís 4000D, PC-8200, ULT-2001, ULT-2002D, PC-8500, NX-450, NX-250, NX-650Q, Innov-ís 1200, QC-1000, PC-210, PC-420, CS-6000i, CS-6000B, HE-120, CE-4000, EX-660, BC-1000, Duetta® 4500D, Innov-ís 40, Innov-ís 80, PC-210PRW, PC-420PRW, Innov-ís 900D, CE-5000PRW, HS-2000, Quattro™6000D, Innov-ís 2800D, Innov-ís 1250D, CE-5500PRW, Innov-ís 950D. Hi, I like to use utube videos for extra help with machine procedures and extra tips created by other owners. Also, there are lots of how-to videos on the different presser feet. Look on eBay for presser feet, the prices are way better there and the quality is the same. I have a query that Picot foot can be used in BROTHER SE400? I can’t get the side cutter to work? Not sure what I might be doing incorrectly, any suggestions? I’m loving my se400and learning embroidery by trial and error, and playing with different fabrics and stabilizers. You (very helpfully) stated that the machine comes with 7 presser feet, but I’m a little lost and don’t know which is which (other than the embroidery foot). Would you mind posting pictures of each on and what/when they are used? I love my SE 400 very easy to use.